This infographic describes the risks and threats which will be created by deploying workloads publically clouds without the correct security guardrails, security services, and the systematic use of security best practices. Securing workloads in the public cloud requires a different approach than that used for traditional data centers. The need to work security at cloud speed, answer continuous modification, adept at scale, and operate with a brand new operational model all need a dramatic shift within the type of security solution required by today’s operation. 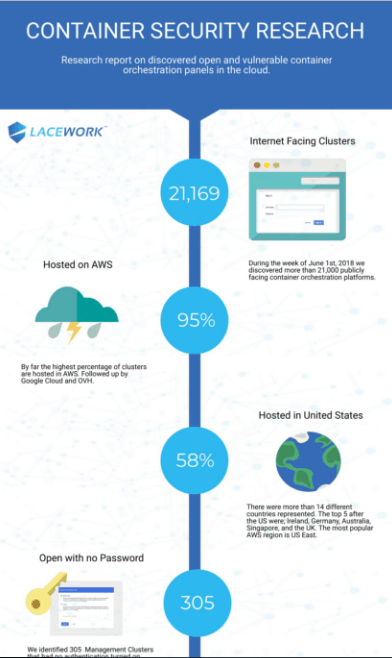 The reality of the risks of operating workloads in the cloud is highlighted in this infographic, representing recent research conducted by Lacework. In early June 2018, the corporate discovered over 21000 instrumentation orchestration and API management systems on the web, and these findings highlight the potential for attack points caused by poorly organized resources, lack of credentials, and therefore the use of non-secure protocols.